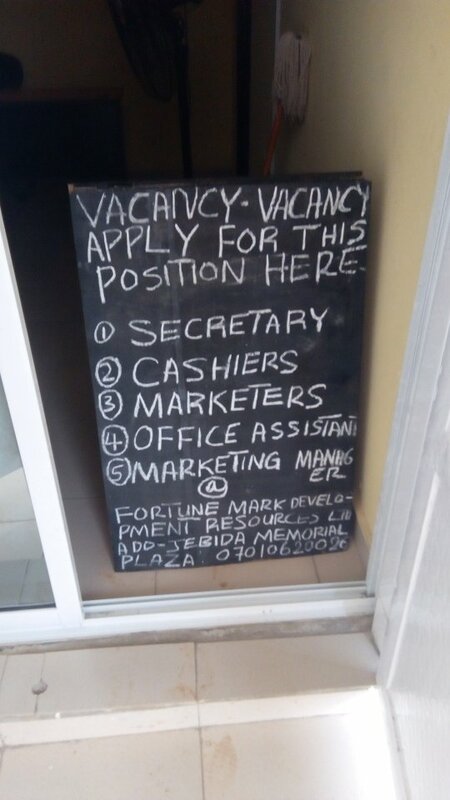 For months, I sent applications around and searched for jobs upandan, no show. And then a job came and the gods of temptation sent agents of shield! 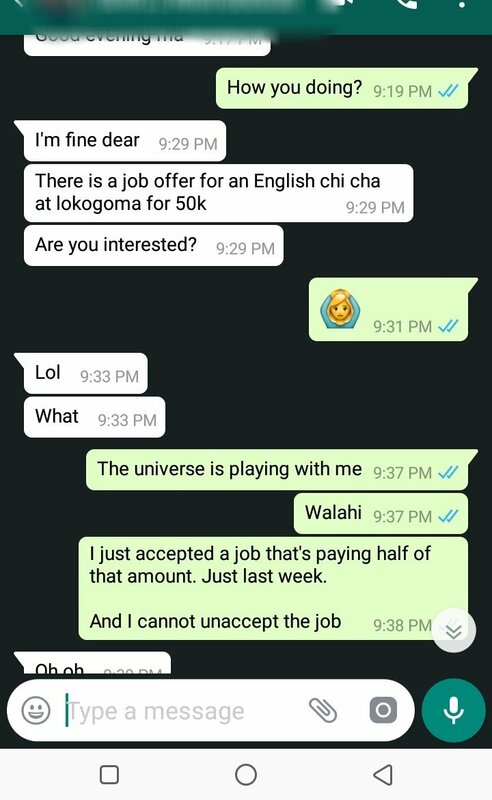 I know you people would ask why I refused a job I would have absolutely loved and one that was willing to pay twice whatever I would be earning. I’ll tell you. First off, I did not want to unaccept the job I already have. I like people that keep their word. I had gotten a job, accepted to work with them, so I intended to keep my word. If you know the opportunities that come to those who keep their word! Besides, I am not about to pass on an opportunity to manage the social media page of an actual business. No, no, no! 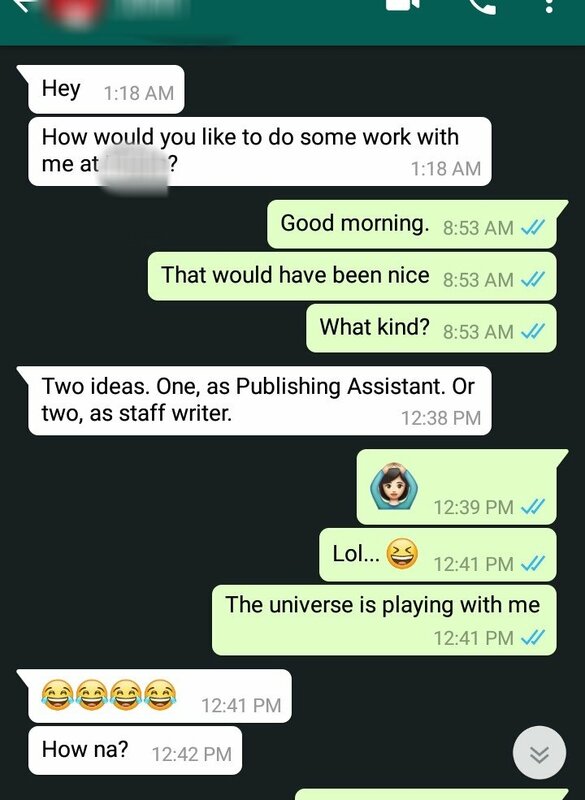 Secondly, as far as the publishing job is concerned, I don’t exactly know how much of a good idea it is to work for someone who you cannot trust yourself with. Too dangerous 😂. And as for the teaching job, where I live in is far away from Lokogoma. If I calculate transportation and feeding for each day, I wonder how much will be left of that salary. This job I already have is of trekable distance from my house. The plaza is #50 bike away. My mother has been pestering me to write an application for this one. But I don’t know. I’m scared of working somewhere I’ll be owed salary for months. At least, I’m sure this school I’ll be working at pays and on time too (I spoke to a staff there who happens to be the sister to my sister’s friend). My own is, why didn’t all these opportunities show themselves when I was still searching? It’s like how you’ll be single and no serious fine boy will be on your matter. Then you just start dating and Fine Boys’ Association of Naija will now release it’s members around you 🙄. Nonsense! Temptation comes in different forms and I think you made the right decision by sticking with the teaching job for now. It wouldn’t be nice of you if you left them even before starting. I didn’t look a it from this perspective at all, but it makes lots of sense. I’m going to ask him if he wouldn’t mind that and see what he says. This post is well titled but no, the universe isn’t playing with you my dear. My response to your seemingly rhetorical question will be, ‘It is testing you’. Just like bad things comes to entice us when the good things we asked for only comes in half the original package we expected, this too is such a situation. The job as a staff writer or an online publishing assistant sounds good but really, if you quit your job, how sure are you that the job will be as satisfying? Besides, you can opt to do this job freelance and agree on working hours and days if they need you physically present. The 2nd job for an English ‘chicha’ as per your description sounds like you will spend half your salary on transport and feeding, so why not stay where you already are where you will not spend so much and still have some cash left to save? It’s really a test and the more I think about it, the more I think I should stay where I am. Thanks, boo 😘. Aye Aye! Somebody is now allowed to legally hold a cane. Congrats NFG. I think good you stuck with the job you already got. You’re close… How d’you know?